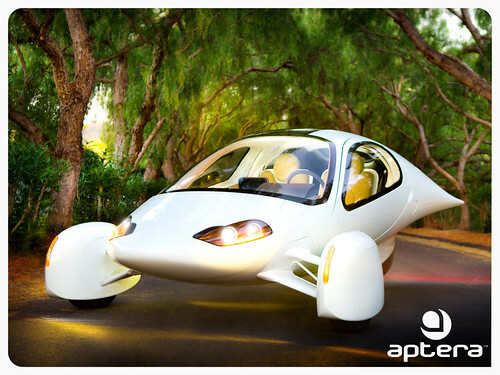 First of all, the Aptera comes in two models: the $27,000 all-electric and the $30,000 gas-electric hybrid. Aptera claims the all-electric will have a range of about 120 miles on a single charge, and will cost about $1-$2 for the average Californian commuter to charge overnight. The cars, according to the manufacturer, will be available late this year. In fact, you can reserve a vehicle by putting down a $500 deposit right now, assuming you live in certain parts of California (in order for the company to provide service on the vehicles, they are only releasing them locally at first). While the car looks a bit like a spaceship, it features standard safety apparatuses such as airbags, and also some nifty bonuses like a solar heating and cooling system. It will convey two adults comfortably, and apparently you can squeeze a third in there, although I’m not exactly clear on whether or not it’s just a ‘child’ seat. Aptera has recently released some footage of the car accelerating, and it doesn’t look half bad. If you choose to go with the gas-electric hybrid, Aptera claims you’ll get around 300mpg on the highway on average. They’ve got an efficiency curve on their site, so you can see where you lose out by having to accelerate or drive stop-and-go.